Hoela Barbedette is a harp player and teacher recognized in the world of folk music. With her play highly inventive, both strong and sensitive, she sets up an original approach of the celtic harp, confirming the liveliness of music in Brittany – this peninsula on the western coast of France. 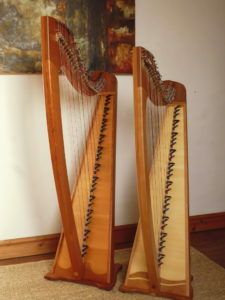 Last November, Hoëla went to the Starfish Designs workshop to pick a new harp : A Glenelle, easier to travel with by train or plane than the Mamore, and… with quarter-tone levers again, thanks to the incredible work of Dave Shepton !